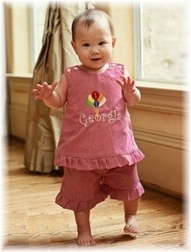 Caroline Bradlee Designs > BIRTHDAYS > GIRLS > Girl's Birthday Balloons Custom Dress Or Outfit. 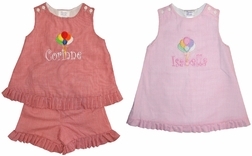 The outfit is made with your choice of color gingham, and the dress or top is appliqued with birthday balloons with a ribbon bow. Your little girl's age is embroidered in the middle balloon, and her name can be monogrammed below the balloons.